Tiny rivets and metal eyelets are a great addition to your sewing notions for dolls! You can use them for custom fitted corsets or to make your own doll boots and doll shoes. They are just the thing for adding a goth look! Use the rivets as decoration on leather pants or jeans. Make a long black dress that laces up. Let your imagination go wild! You will need an application tool to put them on your doll clothes. Important! Be sure to apply either metal or plastic backs, so the rivet or eyelet doesn’t scratch your doll. Plus the rivet or eyelet will stay in place better. 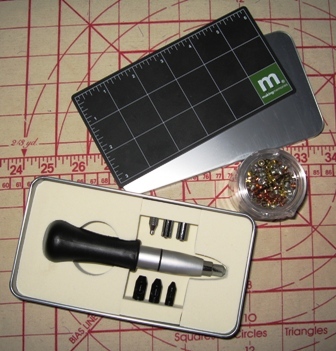 Here is a eyelet or rivet application tool with some eyelets.